Here are the stories of 5 inspiring women who turned the outdoors into their office and their passion into a paying adventure job. The owner of SkyChick Adventures, Ramona flies her plane into the North American wilderness, lands on remote airstrips, and then lives off the land with her bow and arrow for months at time. 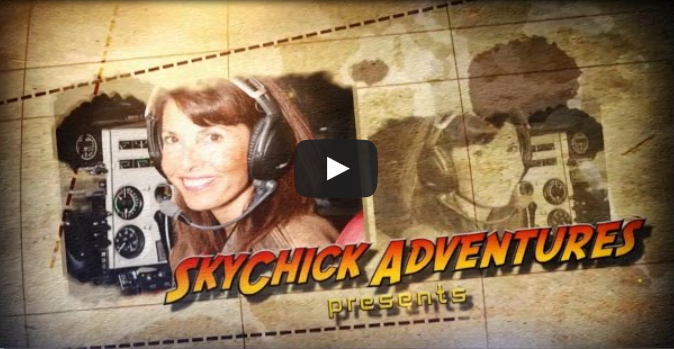 Although she doesn’t lead trips and guide guests, if you attend one of Ramona’s lectures on Adventure Flying or watch her DVD series, you’ll learn all her tips and tactics that she’s acquired from two decades of air camping and adventure travel experience. Watching an orca look her in the eye as it swam by just two feet away is just one of Leah Blok’s favorite experiences as a sea kayak guide for ROW’s Sea Kayak Adventures. Another perk of the job? Swimming in bioluminescence. But that’s what happens when nature is your office. Whatever the day brings it’s the “the incredible interaction with nature” that keeps her stoked on her job. It’s not art that you can hang on your wall, but the lines she draws in air and the on the snow take my breath away. Eleonora first tried scuba diving in the Canary Islands 16 years ago and it was love at first dive. But it wasn’t until she saw another woman working as dive instructor that she realized that she too could turn her passion into an adventure job. Now, she travels the world and makes her living underwater. Yes, there are long hours, heavy equipment, and a lot of responsibility – especially with inexperienced guests. But it’s the channeling of her inner mermaid when she puts on her fins and her passion for travel and the aquatic life that makes it all worthwhile. And now for my true confession: Clubmate at Pacific Islands Club was my first job out of college. Which changed my life forever. It was really hard to work in a cubicle after I was paid to take hotel guests sailing. Now, I’m an adventure writer. I love to take my stories and write them whilst traveling between Los Angeles and Europe. Whatever your passion – there is an adventure job out there with amazing mentors who are ready and willing to show you how to turn your passion into a reality. Heather Kouns: Not everyone will understand why you want to travel to remote destinations for adventure. So, don’t worry about it. Leah Blok: In guiding, people skills count. It’s important to engage clients and leave them inspired and wanting more. Géraldine Fasnacht: Focus and commitment are vital. Especially, when your adventure job involves high stakes. Eleonora Bonafini: Transmitting your passion for adventure and love of nature to guests is very satisfying. Ramona Cox: You don’t have to be a guide to monetize your passion for adventure. You can create a lecture series from your expertise.